Please note that the content of this book primarily consists of articles available from Wikipedia or other free sources online. Bob Bainborouugh is a Canadian actor. He is known for playing the role of Dalton Humphrey in the Canadian comedy series The Red Green Show, and appearances on History Bites. 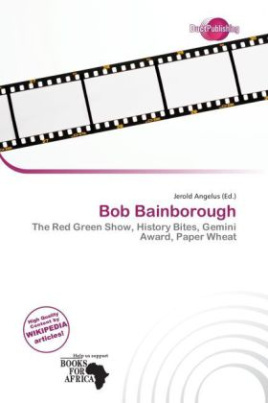 Bainborough was nominated for a Gemini Award in both series. Bob Bainborough had originally registering to begin pre-med, but switch majors and earned a degree in the Fine Arts from the University of Alberta in Edmonton. He began working in regional theatre until he co-wrote and performed in Paper Wheat with the 25th Street House Players in Saskatoon, Saskatchewan in 1973. Paper Wheat was a play about the effect of free trade on farmers. Shortly after Paper Wheat, Bob Bainborough began working with The Second City in Edmonton later moving to Toronto. He remained a member of the Second City Company from 1984 to 1990.